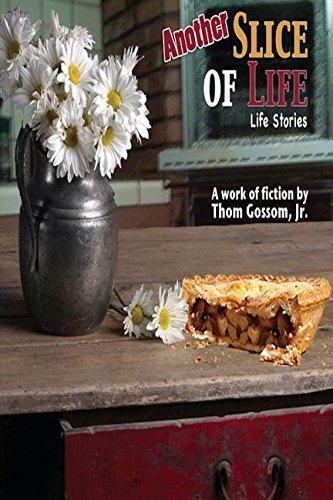 "Another Slice of Life" By: Thom Gossom Jr.
Thom Gossom is a name familiar to many Alabamans. In 1975, He was the first black athlete to graduate from Auburn University, having played on the championship team quarterbacked by Pat Sullivan. Gossom went on to have a career in film and TV acting with a recurring role in “In the Heat of the Night” and guest star appearances on “NYPD Blue,” “ER,” and many others. Gossom has since been active in playwriting, producing, and blogging and has written three volumes of short stories. “Another Slice of Life “is the second. He seems not to have any interest in the longer form, the novel, writing “You eat the pie one slice at a time,” thus the stories. The stories in the first volume were mainly set in his Birmingham childhood neighborhood, Rosalind Heights, and were mainly stories of boys, often happy, playing stickball, listening to music and hanging out. These 11 stories, like the first set, are not the polished work of an MFA workshop. They are somewhat naïve, untaught but affecting, as if Grandma Moses wrote short stories, but the best ones have that same kind of power and appeal. Most of the characters in these stories are slightly older, and their problems, generally speaking, more serious. In several, the characters are living in Los Angeles, a migration destination for many African-Americans in the sixties and seventies. The story “Poo Poo,” set between 1990 and 1995, is told by Tommy, who as a 13-year-old had been hired back in Birmingham to look after 2-year-old Ervin Slade III. Now, 25 years later, Tommy gets letters from Ervin asking for his help in getting him a parole. The letters have the cunning of the con—the convict and the con man—and Tommy resists, but not without a kind of “there but for the grace of God, go I” kind of guilt. A pair of stories tells of Jimmy. In the story “Fat,” the protagonist is walking down a dark street in LA, another man walking towards him. Fat has a knife. The other man, who we learn is Jimmy, has a pistol. Anxiety mounts. Each fears the other and, as the distance closes, we wonder if out of that fear, they will, for no good reason, kill one another. Although neither knew it, both were from Birmingham originally, new to LA. In the next story, we learn more about Jimmy, a drug dealer, who was that night carrying a satchel full of cash. The world Jimmy lives in is violent, and the story opens with Jimmy’s cousin Harold, also from Birmingham, called to make the positive ID of Jimmy’s corpse. Gossom has Harold thinking: “Los Angeles moved at warp speed, while Birmingham inched along and often times moved backward.” The reader is meant to wonder whether the migration to the promised land is an unalloyed good. As in his first collection, Gossom writes about football, not on the field, but in the ways the game in Alabama affects, even warps, minds. Now there is a life with no second act. In the closing story, “Coach,” we watch the new head football coach of fictional Alabama Tech in Birmingham on the day of his first game, in the brand-new domed stadium. He’s black, which is pressure enough, but the paper that morning reads this will be “the day that saves Birmingham.” The black coach and his championship team will erase, then rewrite Birmingham’s sad history.